Report author: Russ Grayson, January 2004. I spent several weeks in the Solomon Islands from late-November and into December. Later, I was joined by Fiona Campbell. As members of TerraCircle, I had been contracted to produce handbooks for trainees in the Sustainable Livelihoods for Rural Youth Project (SLYRP), funded by AusAID. 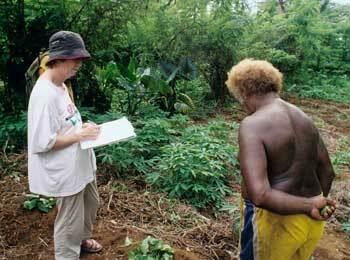 Our mission in the Solomons was to collect information. We were accompanied on our information-collection journeys by the Kastom Gaden Association’s (KGA) Steven Bill Amasi, who is responsible for graphic design, video production and similar media-related activities. TerraCircle was set up by a small team of previous APACE employees (Lisa McMurray, Tony Jansen, Russ Grayson) to continue support for the Solomon Island projects after APACE withdrew; the organisation was joined by John Vail, an Australian with wide development experience in the Southern Highlands of PNG and by Dr Grahame Jackson, a plant pathologist involved in projects in the South Pacific; A team of associates has since joined TerraCircle, bringing expertise in seed saving and training, organisational capacity building, poultry in the South Pacific and Australia, small-scale energy systems, engineering and electronic communication as well as graphic design. The visit was made to collect information, photographs and illustrations for farmer’s handbooks on pig farming and agroforestry. The handbooks are to be distributed to trainees participating in the Sustainable Livelihoods for Rural Youth Project that is being implemented by the KGA. Like other states undergoing instability and declining internal insecurity, the Solomons are characterised by a demographic bulge in the 15 to 30 year age group. With the economic collapse that followed the coup and conflict, there is little by way of education or employment for these youths; consequently, they experience a sense of despair and aimlessness over their future and this can become the anger that feeds unrest. In locations where we were based, groups of these youths were much in evidence. It is the purpose of the SLYRP to address this problem. Although the project is small, I found evidence of success among trainees. The pig farming and mixed-species agroforestry (producing timber, building materials, fruit, nuts and other products) projects are designed to supply families and yield income. There is a market for pigs in rural areas. The intention is that youth participating in the projects will not have to go to the towns in search of an income but will be able to develop an income stream in the villages. There are few prospects for producing income in rural areas apart from those based on agriculture. North Malaita, based at the hamlet of Silolo on Suva’a Bay. I travelled to Choiseul with Steve Amasi. Our 5.45 am flight from Honiara landed us in Gizo early in the day and we made the open sea crossing by motor canoe two days later, leaving just before sun-up to take advantage of calm sea conditions. Solomon Airlines had not yet restarted their service to Taro airstrip on northern Choiseul because there was no fuel reserve in place. Solomon Airlines’ remaining two aircraft were operating a more or less erratic schedule due to the demand for seats at this, the busiest time of the year, and because of fuel shortages at provincial airstrips. Our flight from Honiara, Guadalcanal, to Gizo, Western Province, scheduled for the day before we flew, had been cancelled and we were placed on the next day’s early morning departure, a special flight. The delays, combined with waiting a day for a motor canoe for the four hour crossing from Gizo to Choiseul, ended up making us two days late in getting to Choiseul Province. My contact at Sasamuqa village, Choiseul, had hesitations about supplying information on either pig farming or agroforestry on the basis that they were ‘traditional knowledge’. His reticence was also fueled by his new position in education and uncertainty over his position in the village. He explained that Sasamuqa is a “very political village” and he had to watch himself. It became clear that I had landed in the middle of village politics. I do not believe that so-called traditional knowledge was the major reason for the non-disclosure of information, rather it was some political subtext running through the village. Knowledge about pig farming and agroforestry are already available and traditional knowledge had previously been disclosed to us, with the assistance of the same person, for an ethnobotanical manual some years previously. Our would-be informant said that he supported the concept of the handbooks. I negotiated to contact him by email and send him a set of questions about the information we need. In contrast with those at Sasamuqa, the people on North Malaita were eager to share information. The sharing of information is considered to be critical to rural development. a farmer whose community has built a long stone wall across their land; the settlement is on one side and jungle on the other; it is in this forest that wild pigs roam, fed by the people in the hamlet; when a pig is required for food or ceremonial exchange (pigs are used for compensation, feasts and bride price) it is hunted with dogs; this system represents the keeping of pigs as a semi-wild harvest. We now have enough material to produce the handbooks. A draught of the text goes to Tony mid-January and the handbooks are due for completion by the end of March. On our journeying by motor canoe around Suava’a Bay and the area outside the reef we diverged to go tuna fishing on the open sea, landing two large tuna (locally known as ‘bonito’), one of which became that evening’s meal. This was Fiona’s first experience of tuna fishing. Roselyn and all the others. Thanks to them for their hospitality and assistance. Our base on North Malaita was Silolo, a family hamlet and home to the Silolo Community Email Station. The KGA and Planting Material Network share a building with the Community Peace Restoration Fund and the email station. KGA has built guest accommodation, a leaf house which, like the office, stands above a swamp that is strangely free of mosquitoes, more or less. The email service has been established in cooperation with the People First Network (PFNet) to link isolated areas in Solomon Islands and promote development through better communication and access to information. TerraCircle is working with PFNet in the Solomons and another group in PNG to link partners of the Melanesian Farmer’s First Network, an initiative of the Kastom Gaden Association established to encourage information sharing and communication for development between rural communities and rural development organisations. the Tari email station in the PNG Southern Highlands, based at the premises of Community Based Health Care, a participant in the Melanesian Farmer’s First Network (MFFN), came online only last week; ten email stations now operate in rural areas of the Solomons as part of PFNet; plans exist by MFFN to link a development centre in the highlands of Bougainville and, later, the Farmers Support Association in Vanuatu; email makes it possible for any of these places to link with TerraCircle in Australia. The KGA project centre at Burns Creek in Honiara has grown from four staff the last time we were there to a larger staff and up to 14 trainees from the provinces. A girl’s and a boy’s leaf house have been built to accommodate the trainees who spend up to several months learning improved fixed-site food gardening, seed production and processing and improved kokorako (chicken) keeping. Kokorako keeping is both a subsistence and income generating activity and the system taught was developed by TerraCircle associate and Australian poultry expert, Russell Parker. Two large kokorako houses have been built, one a deluxe two level model – sort of a kokorako tenement – and a kokorako hospital where sick birds are housed in a separate building. One of the youths manages the system as a small business. The project centre garden is now used mainly for seed production for the PMN, to grow the collection of useful botanic species and to model the mixed species agroforest. Nancy, a young woman from distant Temotu province (closer to Vanuatu than the Solomons), lives at the centre. Just before our arrival, a taro (Colocossia species, a staple root crop) diversity fair had taken place on Northern Choiseul (in the village of Taro) and a banana (Musa species) diversity fair on Makira island. Diversity fairs are an initiative of the KGA/PMN where farmers exchange and learn about local varieties of food plants. The banana diversity fair had recently taken place on Makira, where bananas have a special significance in the local diet. The coordinator and curator of the collection, Dorothy, was at the Burns Creek farm on her way to Malaysia to attend training in banana germplasm collection and use. An earlier taro diversity fair was held in 2002. Tony Jansen and Cynthia Kiriau are setting up an impressive home base at Whites River on the edge of Honiara. Building work to modify the existing house is underway and a productive sup sup garden has been established in raised beds on the compacted coral base. The beds are built then filled with discarded organic wastes from the neighbouring Whites River market. This breaks down quickly in the tropical conditions to form a fertile compost in which plants are established. An improved kokorako system of the type developed by one-time Solomon Island resident Russell Parker houses about 15 birds of mixed local and imported varieties, soon to be expanded to around 30. The model is part of the KGA’s training programme, designed to increase nutritional health in rural communities and promote kokorako keeping as a small business/ income generating activity. A composting toilet with a window giving a view to distant Savo Island, out on the horizon, is nearing completion. The house in on the sea front (Tony had to build a sea wall) so the day can be ended with a swim in the sea – there is a coral reef immediately offshore and a sea breeze to be enjoyed on humid days (most days). One of the good points about working in aid and development is that you meet inspiring people who combine a sense of adventure with a commitment to assisting people improve their living conditions. Frequently, these are local people with a commitment to the development of their own people and land. Where they are Australians, they are the true ambassadors of this country, developing organisation-to-organisation and people-to-people links. It is they, rather than the politicians, who best represent Australia in the Pacific. I had the good fortune to meet Chris Chevalier from APHEDA (Australia) who was staying at Whites River. I had heard of Chris from Tony. Chris is doing work with the rural training centres that provide post-school training in practical skills and are about the only avenue for training in rural areas. Chris has an in-depth knowledge of the Solomons and works with the Australian NGO, APHEDA. An environmental management graduate and employee of a large aid contractor to AusAID, and with experience in China and at the Australian National University in Canberra, Karen has been placed for a two-year period by Australian Volunteers International as an organisational capacity builder with KGA/ PMN. Karen is based with Mary Timothy of the PMN on Kolombangara island in Western Province, based at an agricultural training centre. She joins TerraCircle in January 2004. Bruno and Alfonse are leaders of a community development organisation – the Paruparu Educational and Development Centre – set up during the civil war and the PNG blockade of Bougainville . Truly inspiring people, they and their colleagues and communities in the mountains of Bougainville coped with their isolation from the rest of the world by developing fixed gardening (in place of sash and burn), composting and mulching, fish farming in ponds, hydro-electric power using car generators and other innovations. Now, through the Melanesian Farmers First Network, they are seeking to share their knowledge and to learn from others. This will be made easier as soon as the proposed high-frequency radio email network reaches the interior of Bougainville (early 2004), linking them to others in Melanesia and to Australia (via TerraCircle). Peter works with the farmer’s support Network, Vanuatu, and was in Honiara for the second annual meeting of the MFFN. He provides training to farmers in subsistence agriculture and cash cropping of vanilla and spices. Joseph is with Community Based Health Care in Tari, Southern Highlands Province, PNG. His focus is primarily community health, but he acknowledges the important role of rowing a diverse food supply for nutritional health. Like Peter, Joseph was in the Solomons of the MUFFIN meeting. Joini, whose organic market garden is next door to the KGA project centre in Honiara, has been a supporter of the programme since 1994, when it started. I have known Joini for some years and it was good to re-establish contact with him and see his farm still in production. He remains an inspiration. RAMSI – the regional peace-enforcement mission consisting of military and police from Australia, New Zealand, Fiji, PNG, Tonga and other island states in the region – was much in evidence. Police patrols in Honiara and Auki, Malaita Province, were frequent; Australian Army air patrols and Navy maritime patrols were present in the northern provinces as were cargo aircraft and helicopter resupply flights. An Australian Army Iriquois helicopter appeared to be involved in searching in the area where we were in North Malaita (which had been the centre of militia activity by the Malaita Eagle Force – the village up the road was home to the notorious Jimmy Rasta), being present in the area for three days. Australian public servants have been placed in key positions in ministries to discourage corruption and key leaders of the militias have been arrested. The presence of RAMSI has boosted confidence in a brighter future and Solomon Islanders appear to be supportive of the intervention. Military and police interventions, however, are short-lived and it will be up to the actions of governments and aid organisations whether the present mood of optimism is to prevail. It is the development programme that will deliver real gains to people in the country, or not. A highlight of our stay in Auki, Malaita Province, was dinner in the company of the magistrate who wanted to share his bottle of Australian red (he is a gregarious Englishman), two documentary videomakers from the Czech Republiic and two Australian soldiers complete with assault rifles. Danny Besa’a, the agricultural trainer who earlier worked with the KGA before going to England, has now returned to the organization as a highly skilled volunteer. This indicates the success of training local people to assume leadership roles and developing local organisational skills – ‘building capacity’ in aid industry jargon – that was started all those years ago. The need to find funding remains a challenge – that is a constant in the aid business – but funding has come through AusAID, OXFAM and the European Union. As for TerraCircle, the aid consultancy started by a few ex-APACE employees, the start has been promising with involvement in the activities of the KGA, the SRYLP, MFFN and, through other members, in various initiatives in the region. The team is now a regional one, including a Solomon Islander, providing a partnership for regional development linking island states in the South Pacific and Australia.